I don’t have nationality, because now I belong to the earth. I have no longer age, because time has stopped. I stopped fighting to survive, so you do not need to worry. I am no longer a threat to your wellbeing. Besides, now you have no power over me, because you cannot do anything to me. Take your compassion to those who still need you. Are you offended because someone enjoys just a hundred kilometres from me? Come one, don’t be hypocrites. I am dead, I told you. For me there are no more distances. They are the only important thing to you, be honest. They no longer exist to me. And perhaps, they did not have sense even before. 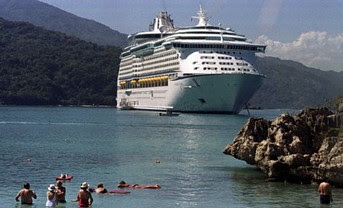 The News: Haiti, tourists on a cruise a few miles from corpses.